Steven Cerio is known for his artwork including his art and video for The Residents, though Aural Innovations readers will be familiar with his music through the Atlantic Drone albums. 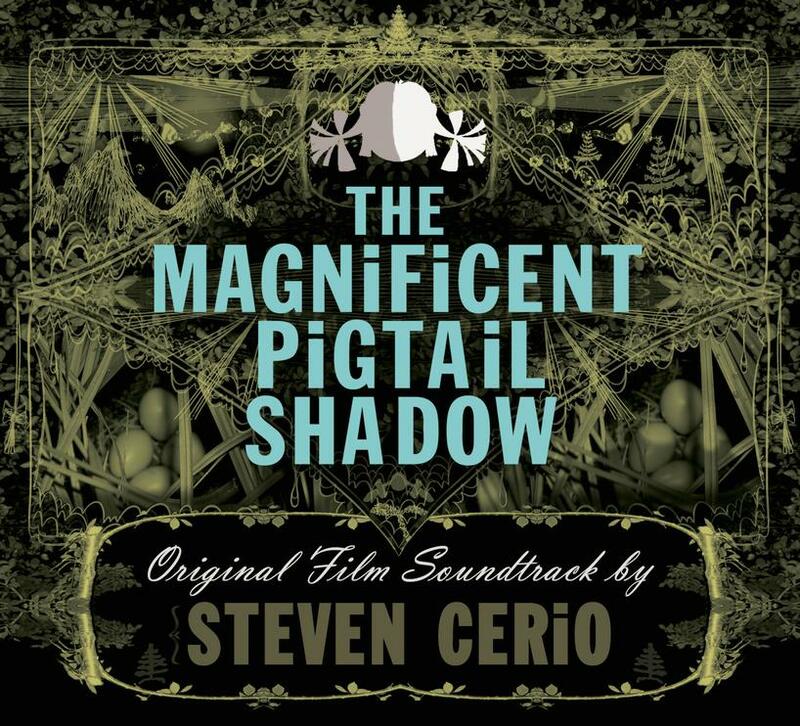 In 2012 Cerio’s film The Magnificent Pigtail Shadow was released. I’ve not seen the film but found a short trailer on YouTube (CLICK HERE) and it’s pretty trippy. And so is the music, which has recently been released by Wow Cool. To create the soundtrack, Cerio assembled a sizable ensemble of musicians, prominent among them being Kristin Hersh (Throwing Muses, 50 Foot Wave) who contributes narration. The first 11 tracks are from the original score, and two of those are remixes of tracks from the 2009 A Vivified Sugar Cube Explains The Universe album by Atlantic Drone. Some of this sounds like lost tracks from an early 70s Brainticket album, though Agitation Free and Ash Ra Tempel come to mind as well. There’s a tribal grooving feel amidst a stew of free-wheeling trippy Psychedelia that’s emblematic of the afore-mentioned bands’ experimentalism, with Hersh’s narration adding a raspy voiced poetic and often shamanic presence. There are also Free-Jazz elements, with a surreal combination of wailing horns, drumming and avant-guitar ensemble, leading into narration against a haunting atmospherics backdrop and then melting into an eerie morphing of tripped out soundscapes, effects, West Coast Psych jamming, freakily efx’d narration and avant-garde minimalism. We’re also treated to several beautifully lysergic dream sequence passages that consist of soundscapes and drones, though these are punctuated by a parade of dissonant, orchestral, Free-Jazz and sundry effected bits and pieces. And it all flows seamlessly, making for an image inducing and often mind-bending adventure. Tracks 12-19 are unused outtakes from the sessions which provide about 25 minutes of tasty extras. In summary, If you like the most free-wheeling of Psychedelic Krautrock, Sun Ra at his most experimental, and the avant-garde minimalist pioneers all brought together in a surreal soundtrack format, you’ll dig The Magnificent Pigtail Shadow. I’d love to be in a theater watching the film with the soundtrack performed live.